The track and field teams, unable to access the Towne Field House, currently practice in Lansing Chapman Rink. Sabrine Brismeur/Photo Editor. After discovering further hazardous materials in the Towne Field House, the College has pushed back its scheduled reopening from Jan. 2 to March 8, marking the second delay in its reopening. The resurfacing project was initially supposed to be completed on Oct. 28, before the start of the winter sports season. The unexpected closing has forced a wide variety of sports teams, student groups and community members to adapt. In November, the Record reported that the construction team discovered asbestos in the glue beneath the track (“Asbestos discovered in field house,” Nov. 14, 2018). In recent weeks, the team discovered additional dangerous chemicals beneath the surface. “Lab results from samples of our track material showed mostly trace amounts of arsenic, lead, mercury, barium and chromium,” said Rita Coppola-Wallace, executive director of design and construction. However, Coppola-Wallace assured that the dangerous materials were contained beneath the surface, so those previously using the field house were never at risk of exposure. Due to the scope of the effects of the field house closure on a variety of campus and community spheres, the College has paused the resurfacing project for the rest of the year in order to open the building on March 8. “Once the Towne Field House is reopened, it will be open and usable by all who have used it in the past. With the exception of a few localized areas that may be coned off, the disturbances have been repaired in a way that makes them safely usable,” Coppola-Wallace said. According to the current plan, the field house will be open for athletes and community members to use, as well as for alum events and Spring Fling. The College will then resume the resurfacing as planned in June. While the reopened field house will be safe from the hazardous materials found beneath the surface, the track itself still presents dangers to those who use the space. “The floor was so bad that people were actually getting injured from overuse and shin splints, so something had to be done,” Williams Outing Club (WOC) Director Scott Lewis said. Because the field house was built in 1970, numerous repairs have been required over the years, making the building a challenging space for those who use it. The construction team has not been the only group forced to adapt to the difficulties of the renovation. A wide variety of sports and club teams, both in and out of season, have faced issues with practice time and space due to the extended closure of the building. Pete Farwell ’73, head cross country coach and assistant men’s and women’s track coach, explained the adjustments runners have made without access to an indoor track. During the cross country season in the fall, athletes had to shelter in the hockey rink due to inclement weather. 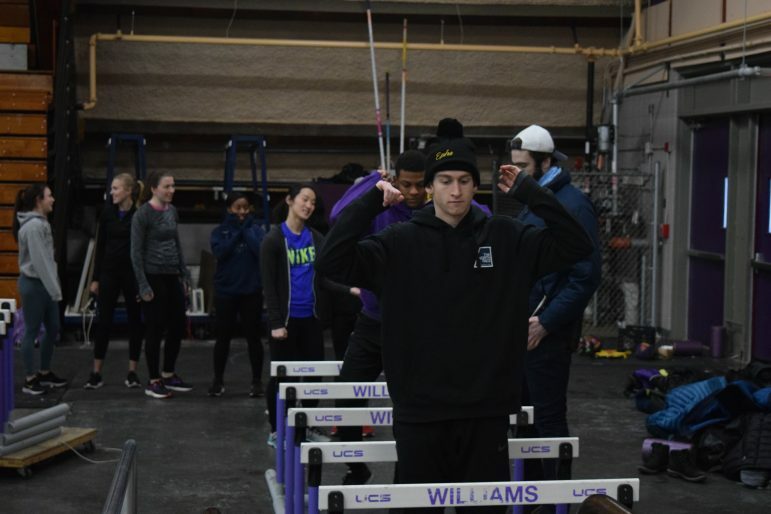 In the winter season, the track teams have continued to make use of the hockey rink and Lasell Gymnasium as alternative practice spaces. “That challenge is even more severe,” Farwell said. “They had to bring in lots of mats so they could bound and high jump pits and things but there’s not very much room… They’re building a raised runway and then putting mats over it in Lasell Gym.” Farwell also recognized the hard work of facilities staff in moving bleachers back and forth to clear spaces for practice. Despite the track team’s lack of a track, Farwell expressed hope for the team’s prospects. “I think the team again has been very adaptive and positive and really going at it, and we had some pretty good results at the Little Three meet,” he said. The lack of the field house also makes the rink more crowded during home games. “The visiting team usually warms up in the field house so now that they can’t do that, we have to share the off-ice warmup area in the rink,” Rush said. The track teams’ use of Lasell has also made the gym tight for space. With men’s and women’s crew, softball, and others often using Lasell for out-of-season practices as well as men’s and women’s basketball, which are currently in season, scheduling around and sharing space has affected those who do not directly use the field house. In addition to struggling to secure practice time in Lasell, softball and baseball, which normally practice in the field house during the winter, have felt the impact of restricted practice space during their off-seasons. “We can’t play softball in anywhere near a full capacity in the other indoor athletic spaces,” softball captain Casey Pelz ’19 said. The team has taken to practicing in hallways in Lasell and Chandler, and the athletes have expressed frustration with the continuous delay of the reopening date and the inability to fully practice. “None of us have been able to hit a moving ball in months, which we can’t help but feel will leave us uniquely underprepared when our season actually comes,” Pelz said. Men’s tennis has taken to driving to Bennington to play on indoor courts, since they cannot practice in the field house. Instead of hitting five or six times a week with the field house, they now only practice three times a week. “If it stays like this, we’re going to go into spring break super out of form,” team member Arturo Kam ’21 said. In addition to varsity athletics, the extended closure of the field house has also had a large effect on club teams. Williams Ultimate Frisbee has been practicing outside for the duration of Winter Study. WOC and the Climbing Club have also been affected. “[The climbing wall] is extremely popular … through people in the community that we sell climbing memberships to and obviously for our PE programming when we teach rock climbing classes,” Lewis, director of WOC said. Lewis noted that between 2000-2500 people use the climbing wall each year, none of whom have access to a wall in Williamstown this year. Additionally, students employed at the climbing wall have not been able to earn money there this year. The Climbing Club, which normally practiced in the field house four times a week, has changed to driving once or twice a week to the nearest wall an hour away in Albany. “It’s a lot harder, it’s a much bigger chunk of time to commit and it’s a lot of driving,” Climbing Club leader Felix Knollmann ’19 said. He also recognized the impact of this change on participation in the club, especially among first-years. “It’s likely that a lot of the freshmen that would have been very into climbing have moved on to other things and won’t know about it as much going forward,” he said.